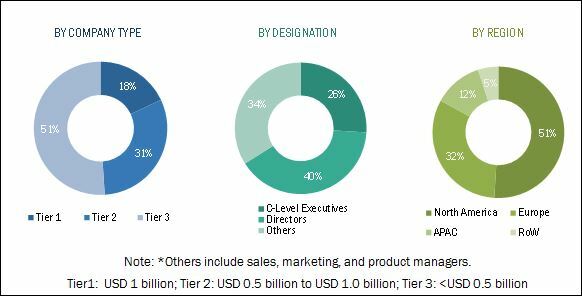 [192 Pages Report] The threat detection systems market was valued at USD 48.38 billion in 2015 and is estimated to reach USD 119.17 billion by 2022, at a CAGR of 13.11% during the forecast period. The growth of this market is propelled by the increasing acts of terrorism across the globe in the past few years. Due to which governments in terror-affected nations to introduce new regulations making it mandatory to install advanced security systems across airports, commercial centers, and tourist destinations. The base year considered for the study is 2015, and the market size forecast is provided for the period between 2016 and 2022. The value chain analysis of the threat detection systems market shows the industry insights through raw material suppliers, component suppliers, system designers and manufacturers, system integrators, distributors, and providers of post-sales services. The major value to threat detection systems is added during the system designers and manufacturers, system integrators phases. The market ecosystem includes threat detection equipment manufacturers such as Smiths Group PLC (U.K.), Safran S.A. (France), FLIR Systems Inc. (U.S.), Thales S.A. (France), Rapiscan Systems Inc. (U.S.), RAE Systems Inc. (U.S.), Chemring Group plc (U.K.), ChemImage Sensor Systems (U.S.), Mirion Technologies Inc. (U.S.), and Axis Communication AB (Sweden), among others who offer threat detection devices to end users. Market size for 2019 and 2021 for segments such as by type, and product/systems, application and geography. Threat detection systems are used in various end use application like Defense, Public Infrastructure, Commercial, Industrial, Institutional and Residential. Public infrastructure is the largest application area of threat detection market these sysetms are deployed in places like airports, railway station, sport stadiums, shopping malls, pilgrimages and others . With the continuous development of technology and increasing government regulation for security devices, there is a rise in adoption of threat detection products such as explosive and narcotics detectors, personal radiation detectors, dosimeters, survey meters, identifiers, photo-ionization detectors (pid), air samplers,chemical agent detectors, biological agent detectors, radar systems, video surveillance systems, perimeter intrusion detectors, wide-band wireless communication systems, biometric systems and others. The Threat detection ecosystem witness concern of technological limitation associated with threat detection systems, when will this scenario ease out? 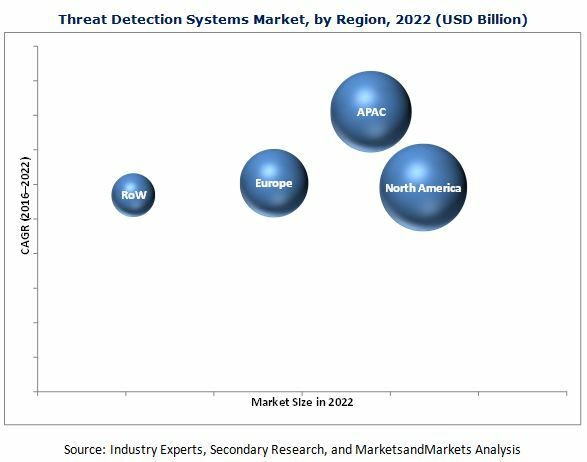 The threat detection systems market is expected to reach USD 119.17 billion in 2023 from USD 56.91 billion by 2016 at a CAGR of 13.11% during the forecast period. The growth of this market is driven by the increase in the terrorist activities and rising territorial conflicts and geopolitical instabilities. Government regulations also play an important role in the increasing demand for the threat detections systems. Based on product/systems the threat detection systems market has been segmented into, Explosive and Narcotics Detectors, Personal Radiation Detectors, Dosimeters, Survey Meters, Identifiers, Photo Ionization Detectors, Air Samplers, Chemical Agent Detectors, Biological Agent Detectors, Laser Systems, Radar Systems, Video Surveillance Systems, Perimeter Intrusion Detection Systems, Wideband Wireless Communication Systems and Biometric Systems. The Video surveillance systems accounted for the largest share of the overall market and is expected to grow at a high rate between 2016 and 2022. Increasing need for reconnaissance at commercial places, industry premises, and public avenues is one of the prime factors which are leading the demand for video surveillance systems. Video surveillance recordings are also used for investigation purpose in many crime scenarios which is also driving the market for video surveillance systems; this factor is also driving the growth of the threat detection systems market for video surveillance systems. Based on application the threat detection systems market has been segmented into, Defense, Public Infrastructure, Commercial, Industrial, Institutional, and Residential. Public infrastructure is expected to hold the largest market share of threat detection systems. The commercial sector is expected to be the fastest-growing market by 2022. Intrusion detection systems are used on a large scale in office spaces, banks, lodging, and warehouses. Video surveillance systems and biometric systems are used on a large scale in the commercial sector to restrict the unauthorized access. Increasing threat of terrorism in public places is the key reason in increasing the demand for threat detection systems such video surveillance systems and explosive detectors, among other detection technologies in public infrastructure application during the forecast period. North America is expected to dominate the threat detection systems market during the forecast period. The region contains several manufacturers and component suppliers of threat detection and border security systems. North America is witnessing a continuous increase in the research & development activities, particularly in the high-energy laser system technologies. The key restraining factor for the growth of the threat detection systems market is the concerns over intrusion of privacy. Companies have adopted the new product developments and partnerships, contracts, agreements, & joint-venture strategies, to expand their market presence and distribution networks in the threat detection market for the forecast period. Some of the major players in the threat detection systems market are Smiths Group PLC (U.K.), Safran S.A. (France), FLIR Systems Inc. (U.S.), and Thales S.A. (France). The initial capital investment on product development and setting up an efficient manufacturing process to build reliable products is quite high. Moreover, the companies also need to earn the trust of the market to gain new contracts; hence, the impact of new entrants is considerably low. Infrastructure is one of the key application segments for threat detection systems. Infrastructure consists of applications wherein large areas such as airports, railway stations, and other areas need to be covered for surveillance. Also, the transportation is a part of infrastructure sector which includes railway stations, airports, bus stations, and vehicles. Such video surveillance reduces the need for security guards as they can only conduct periodic check of each location. This is increasing the demand for video surveillance system in this segment. In this segment, various commercial areas such as corporate offices, banks, lodging, retail shops, and healthcare clinics are considered. In addition, non-manufacturing buildings such as warehouses are also considered under this segment. Threat detections systems are being used in private sectors on a large scale. Biometric systems are used in IT companies for the identification and access purpose. This helps in maintaining security by disallowing unauthorized persons from entering private offices. Handheld and walk-through metal detectors are used at the entry point of corporate buildings to detect any unwanted metal objects. X-ray screening systems are installed in private companies to detect any illegal objects carried by employees in their baggage. Video surveillance systems are also used to keep watch in office surroundings and enhance the safety of the office environment. It is very important to maintain security at workplaces to ensure the smooth functioning of the private sector companies. Due to such advantages of the threat detection devices, their demand is expected to rise soon. Which industry will hold the major market potential in threat detection systems ecosystem?